Fine Arts Center Blog: Free Family Adventure Day: Celebrating Carnival! Free Family Adventure Day: Celebrating Carnival! Learn about carnival and create your own colorful mask! Sat., Feb. 11, 2012 | 10 a.m. - 2 p.m.
Treasure a day with your family, enjoying artist demonstrations and hands-on art projects led by Bemis School of Art instructors that include hand-building with clay, mask collages, and painting. Create your own works of art during this day of discovery that has a thematic focus on the festive "Carnivale" traditions. 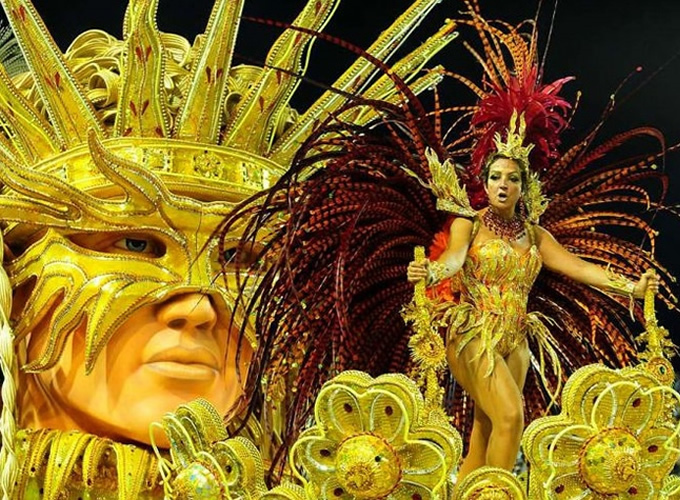 Carnival is known all around the world, but there is more to the elaborate masks, costumes, and floats than meets the eye. Catholic followers in Italy originally started Carnival as Carnevale, a Latin word meaning, “to put away the meat.” This extravagant tradition takes place right before Lent when Catholics aren’t suppose to eat meat. As Carnival became famous in Italy, European settlers took the tradition with them as they set up colonies in the Americas. Slaves were also brought to the colonies at this time, adding African influences to the tradition. Today, Brazil is famous for Carnival. Elaborate masks and costumes are mainly made out of feathers but, beads, fabric, and even bones are used. Headpieces symbolized the ability to overcome an illness, pain, or heartbreak. Masks allow people to hide their identity and be someone else. Samba, a popular dance style with African roots, is popular at Carnival in Brazil. During ancient times, Africans would dance around in circles in the parade through villages in masks and costumes because it would bring good fortune or help fix their problems. Explore more of the festive side of Carnival at Family Adventure Day! Plus, don't miss the free, docent-led tour of the FAC galleries at 12:30 p.m— including one of your last chances to see Coalescence at the FAC, a exhibition of Barbara Sparks' breathtaking landscape photography. Hope to see you at Bemis School of Art this Saturday, Feb. 11! Jawbreaker as Art — just don't lick it. Public FREE day ALL DAY!